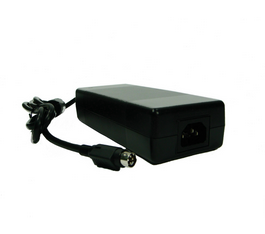 This series of AC/DC switching power supplies are for 180 watts of continuous output power. They are enclosed in a 94V-1 rated polyphenylene-oxide case with an inlet of the IEC320/C14 or IEC320/C8 to mate with interchangeable cord for world-wide use. All models meet EN 55011 and FCC class B emission limits, and are designed for medical applications not for life-supporting equipment. 1. Class I models are equipped with IEC320/C14 inlet, and class II models with IEC320/C8 inlet. 2. Ripple and noise is maximum peak to peak voltage value measured at output within 20 MHz bandwidth, at rated line voltage and output load ranges, and with a 47 μF electrolytic capacitor in parallel with a 0.1 μF ceramic capacitor across the output.